This is my 31st post of this year of posting every day. It’s not the easiest goal, especially with Facebook out there. I go to blog sometimes and I feel like y’all already know everything I’ve been up to. But I’m psyched I’ve been able to get through this month blogging each day. It got easier as the month went on. And so many things are on the horizon that I have plenty to talk about. Don’t forget- go sign up for Ebates and earn TONS of cash back from your online shopping. Plus I’ll get $5 for referring you! Then you can refer people and earn $5 for yourself! See ya in February! We have been writing a 2 as the first digit of our year now for 11+ years. I think we’re all used to the fact that any low number year that is mentioned happened in the year 2000 or later. So can we drop the 0 now? I mean, why do I have to say “Oh we got married in 2001”? Or ’01? Can’t I just say 1? I doubt anyone out there is thinking, WOW this chick looks fantastic for getting married in 1901! If you want to share a story of something that happened in 2010 no one would think you meant 1910 or 1810! We’re all busy people. Who wouldn’t want the extra seconds back that you’d save by not saying two thousand each time you mention the year?? Who’s with me?? Start practicing. In 11 we’ll be married 10 years. In 12 we’re going on a Disney cruise. In 13 I’ll be 40. See how easy! Clip it or skip it? I recently signed up to receive email updates from Couponing to Disney. I don’t coupon but I like a lot of her tips and freebies. 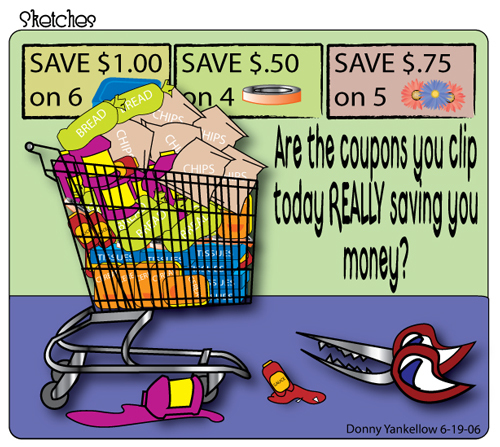 CSP isn’t big on coupons (and he’s a grocery store manager!) and we do the bulk of our shopping at Aldi where everything is private label so they don’t take coupons. But I read recently, I think it was on one of the Couponing to Disney emails, that if you are really diligent in your couponing that your hourly rate (if you equated it to being paid) would be over $80! That’s amazing! I have friends who are really into couponing. They have binders and know how to check all the ads and are real pros at it. I have been thinking about whether or not I should give it a go. Thing is though, it’s just us two. Also, we are short on storage space. We don’t have a pantry. We do have a laundry room but it’s more of an extra large closet. I’ve seen situations where people have mini storerooms in their houses! Rows and rows of product. So for those of you who coupon, would it be worth it for me to do it? I was thinking that if I started now then I’d be pretty good at it by the time the kidlets come home. But if you have to have a ton of storage space to do it right then count me out. Help! I asked CSP who did he take to the prom? I don’t remember was his reply. Who was your first kiss? I don’t remember. Your first date? I don’t remember. Your first hanky panky? Again, I don’t remember. How is this possible? He barely remembers our first date. Or where he puts things. Or what we did yesterday. Me? I can tell you every detail of every prom I went to. All about my first crush, first kiss, first heartbreak, etc. Sure, some other details get a little foggy (like where I put my back up pair of glasses), but milestone events? I’ve got that down. So how does he NOT know?? Is this a man thing? Or has CSP just started seriously losing his mind?? I receive the Photojojo newsletter in my email and the just talked about the coolest thing! They now make SD memory cards for your camera that upload your pics for you- straight from your camera via wifi! Amazing! It’s called Eye Fi. Your pictures go to a photo sharing site like Flickr. 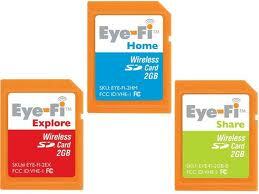 Eye Fi is not the cheapest thing but you’re paying for convenience and magic! The more you pay the more features and memory you get. Think about all the cool events this would be great for! Births, birthdays, parties, graduations, trips etc. If some family and friends can’t be there but you’re near wifi, then your fam & friends can watch it unfold as it happens via the photos you upload! It’s like they’re there in real time! Amazing! The photography nut/techno geek in me is drooling! On Jimmy Fallon the other night they talked about the worst date you’ve ever been on via hash tags on Twitter. He received some hilarious responses. Got me thinking about some of my terrible dates. I kissed a LOT of frogs before I found CSP! One guy took me to dinner at Olive Garden then to a movie. He kept burping up his dinner all throughout the movie. Stunk SO bad! I had to go out for air so I wouldn’t throw up! One guy told me we were going out for Mexican for dinner on our first date. He took me to Taco Bell. Another guy used a coupon for dinner, stopped at a vending machine and told me I’d better get my movie beverage and snacks at the machine, then I had to pay for my own movie. I’m all for being frugal but come on! The same guy (I can’t believe I gave him another chance!) and I went to a friend’s house for a barbeque. Before we all sat down to eat Mr. CheapSkate made himself a sandwich to go, put it in a ziploc bag and put it by the door! He said he was preparing for work the next day. I broke up with him there and had someone else take me home! Tell me about your worst date! Tiger mother or kitty mom? 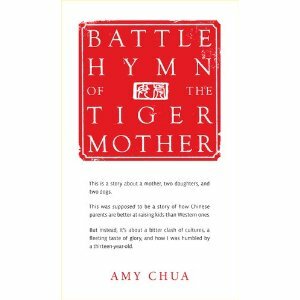 I have not read the book Battle Hymn of the Tiger Mother. I have read many articles about the book, which is not as good as reading the book itself. I’m not sure I want to read the book. But that’s not what this post is about. As you can imagine, over the last 5 years of our adoption journey, and even for years before we started the adoption process, I’ve been more than a casual observer of parents and parenting styles. Much like the betrothed girl makes mental notes at her friends’ weddings, I’ve been creating a file of parenting dos and don’ts in my head. CSP & I have discussed at length the different parenting styles we’ve experienced and observed and our feelings on both. We’ve attended seminars and webinars. We’ve read books and articles and blogs galore. We’ve watched films. We completed the foster parenting classes. We have a good idea of the types of parents we want to be. We also know that all our ideas and dreams might be turned on their heads when our kidlet arrives. We’re smart enough to know that we have to be flexible and that each child is different. Back to the Tiger Mother. Amy Chua has sparked quite an uproar on mommy blogs and among parents of all types. I’ve not seen much, any really, talk about this book amongst my mom friends. I’m very curious to hear what y’all think about Ms. Chua’s parenting style. Now, I’m sure that we are all in agreement that it’s not good to call your children “gargbage” and I’m not interested in debating the differences between Western and Chinese parenting styles. Some critics are saying that Ms. Chua’s book is misrepresenting Chinese parents anyway. If you boil it all down though, I think the debate can be summed up with strict vs. indulgent parenting. CSP & I have been witness to both. And we’ve noticed that many of our friends are more strict as parents than recent generations. It feels almost as if we’re getting back to a similar parenting style that we grew up with. We like that. No means no, there are consequences for your actions, we leave if you act out, etc. I don’t think this is anywhere close to being a “Tiger Mother” but it’s a far cry from the indulgent or absentee parenting that some may say is responsible for kids disrespecting their parents, poor work ethics, the recent rash of bullying and teenage pregnancies, etc. We want to be firm, fair, and consistent parents. We want to be loving and promote good self esteem while also instilling drive, determination, and a good work ethic. We want to prepare our kids for the harsh realities of the world while they enjoy the fun of a magical childhood. Maybe we’ve got stars in our eyes. Maybe we’re naive. But we think (hope) we can strike a good balance between harsh Tiger Mother and pushover Kitty Mom. And if we do then maybe our kids will turn out pretty great.